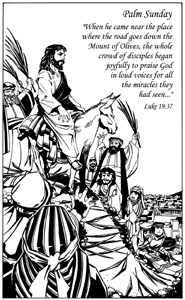 Easter is the annual celebration of the resurrection (the rising from the dead) of our Lord Jesus Christ. Jesus's resurrection is the defining event of Christianity. 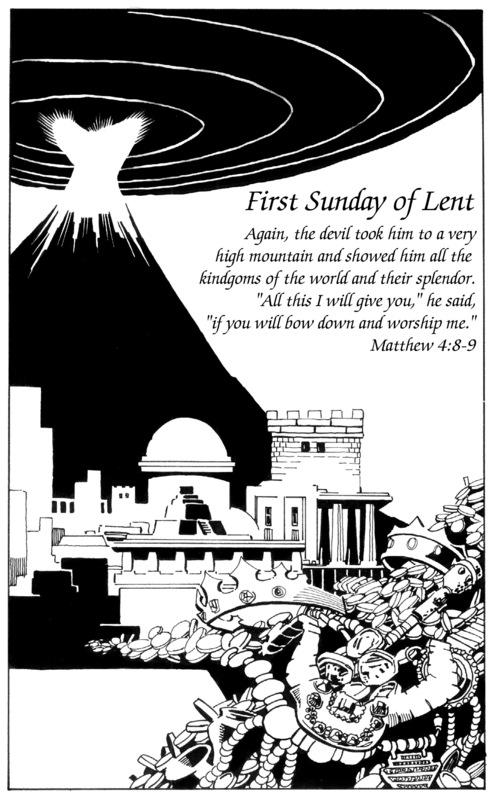 The Easter Sunday celebration is often preceded by the forty days of Lent, and it can often be followed by the forty days until Ascension Day. 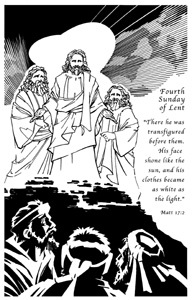 Lent is a traditional time of fasting and preparing for Easter. 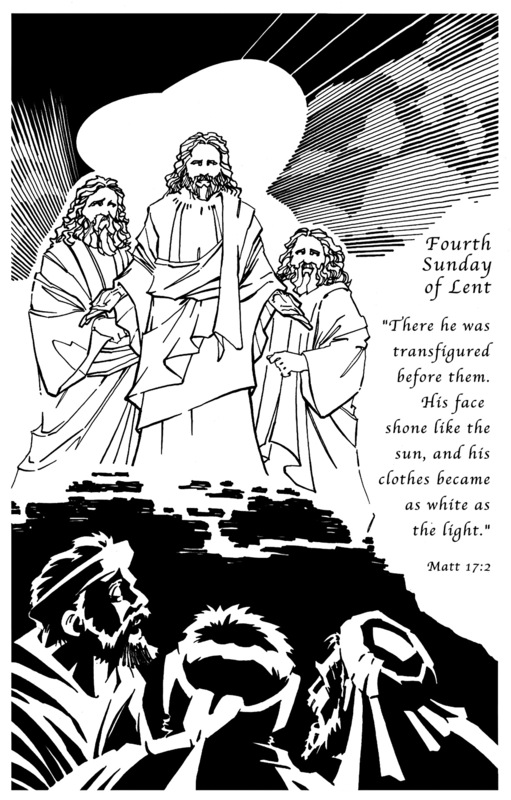 Lent begins at Ash Wednesday, when ashes are sprinkled on the heads of penitent people (people who are sorry for the wrong-doing in their lives, and who want to change their lives for the better). The ashes are a mark of humility before God, of contrition (a sincere remorse for wrong-doing), and mourning (mourning because wrong-doing separates us from God). Ascension day celebrates the rising of Christ into heaven. It always falls on a Thursday, exactly 40 days after Easter. After Jesus's resurrection, he appeared to many (maybe you recall his meeting with the disciple formerly known as 'Doubting'-Thomas??). Jesus' ascension into heaven ended his presence with us on earth until his next coming. As you can see, Easter is not a one day celebration, but rather it is a long, thoughtful remembrance of the life, death, and resurrection of our Lord. 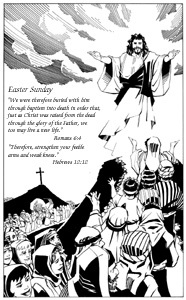 Easter Sunday, a celebration of our Lord's victory over the grave by his resurrection from the dead! Whew! I told you this was a busy time! 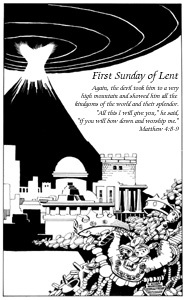 Since the first Nicene Council, AD 325, the date has been fixed as the first Sunday after the first full moon on or after March 21 (the spring equinox). Therefore, the earliest possible date of Easter is March 22; the latest is April 25. The date of Easter roughly matches the date of the Jewish Passover. Rev. 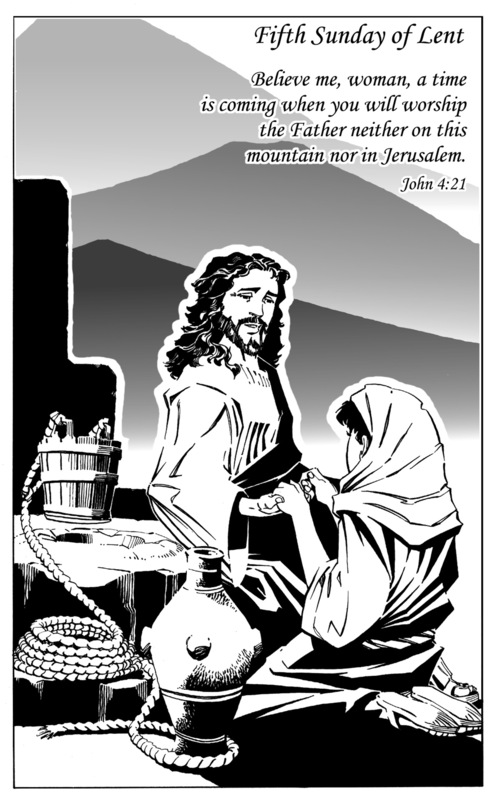 Jim Sheldon wrote an Easter series of sermons on the 'Mountain Experiences' of our Lord, and he asked me to do art for the Sunday morning worship service bulletins. The art for each is shown below. I hope that you like them, and more importantly, I hope that you think about what Jesus did for you and me about 2000 years ago. 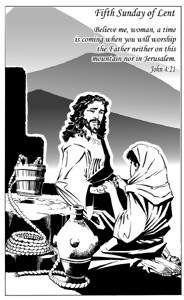 Jesus shows us the way to overcome 'mountains' of temptation. 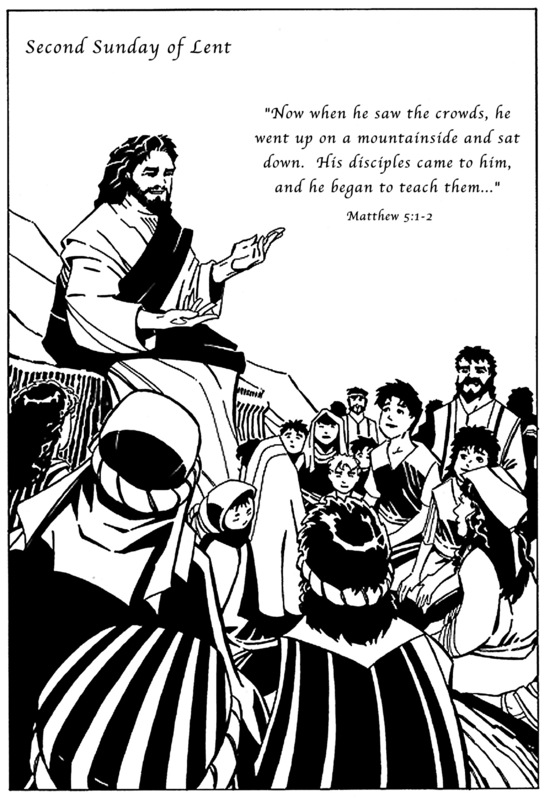 Then Jesus went up on a mountainside....Jesus then took the loaves, gave thanks, and distributed to those who were seated as much as they wanted. 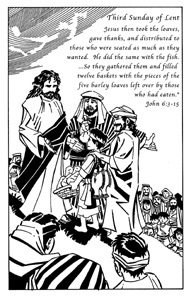 He did the same with the fish. 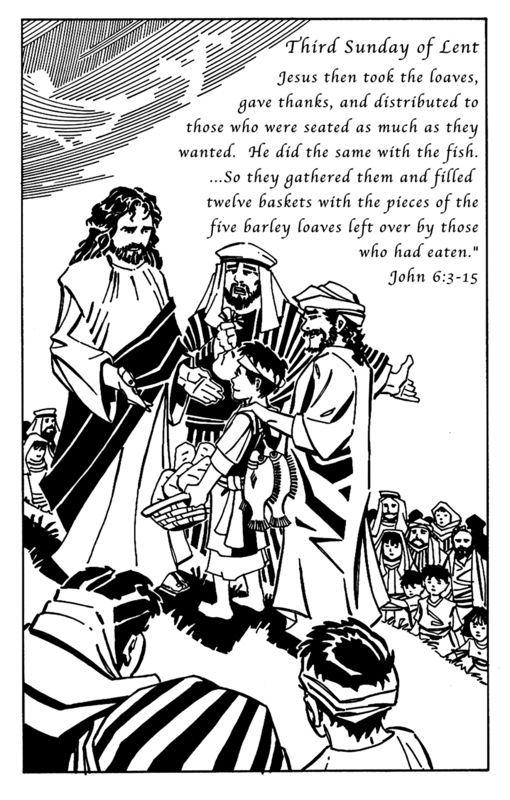 ...They gathered [the pieces] and filled twelve baskets with the pieces of the five barley loaves left over by those who had eaten. The great providence of Christ. Click thumb to open larger version in new window! The Mountain of glory is shown through Christ. Jesus declared, Believe me woman, a time is coming when you will worship the Father neither on this mountain nor in Jerusalem. Acceptance of the Mountain of worship for all. Climbing the 'mountain' of extreme challenge and fear. Standing on the 'mountain of glory' because of Christ. All the images are copyrighted © 2010 Scott McDaniel. Reproductions ARE allowed! !